Last weekend, at one of his chess parties, Mike Splane showed us the following miniature game where he won in 13 moves (!) against the Fort Knox Variation of the French Defense. Oh, were you expecting instructions for breaking into the U.S. Bullion Depository? Sorry, wrong website! Mike was playing an anonymous player a few days ago (name withheld to protect the guilty) in a 15-minute game. The game began 1. e4 e6 2. d4 d5 3. Nd2 de 4. Nxe4 Bd7. This is the Fort Knox Variation. I’m not sure how it got its name. It was played as long ago as the Corzo-Capablanca match in 1902. and probably even before then. However, it has only become really popular in the last two decades or so. Black has a very simple strategic plan: He wants to exchange off his bad light-squared bishop. Black normally plays it to c6 on the fifth move, forces White to retreat his knight from e4, and then takes the f3 knight. Then Black plays … c6 and basically defies White to make any progress. White’s main hopes for winning rest on the break d4-d5, but this is seldom possible. As you can see, this is a pretty draw-oriented variation for Black. 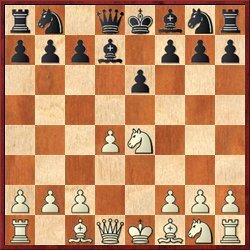 Instead of challenging White’s center with … c5 as he does in nearly every other variation of the French, Black is content to play … c6 and just wait. Not really recommended, but it took his opponent right out of book, and in a 15-minute game that’s not a bad idea. 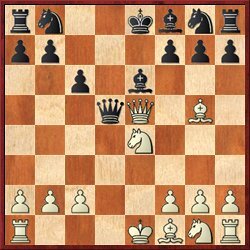 According to ChessBase, this move has been played only 8 times. The highest-rated player to play it was Ponomariov — but before you get excited, it wasn’t Ruslan Ponomariov, one of the top ten players in the world. It was some 2300 player named Timur Ponomariov against a 2100 player named Sergey Korolenko. Korolenko found what is probably the most accurate answer: 5. … Qe7. Because of the threat to open the e-file and pin the e4 knight, White is almost forced to play 6. de Qxe6 7. Qe2, after which he has achieved less than nothing. However, most Black players will reflexively play 5. … ed, as Mike’s opponent did in this game, and that move cannot really be bad. Mike continued 6. Qxd5, and we already have reached the critical position in the game. Here’s a twisted challenge for you: Find the worst possible move for Black. What I’m looking for is a move that looks superficially plausible, yet in reality leads to utter disaster. Let’s start with what Black should do. Of course he can play 6. 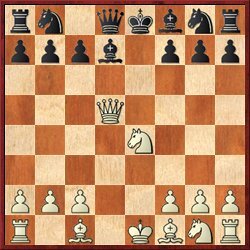 … Bc6 now, but the playability of that depends on how much you think Black should worry about losing the castling privilege after 7. Qxd8+ Kxd8. The more natural move, we all agreed, was 6. … Nc6, after which Black is ready to start kicking White’s queen around with … Nf6 or … Be6. What no one suggested was the stunningly bad move that Black actually played: 6. … c6?? The most entertaining loss is 7. … Ne7? 8. Nd6 checkmate! Another speedy mate follows after 7. … Be7? 8. Qxg7 Bf6 9. Nd6+ Ke7 10. Qxf7+! Kxd6 11. Bf4+ Kc5 (11. … Be5 allows Black to survive longer, but White breaks the bank just the same after 12. O-O-O+ or 12. Rd1+) 12. Qc4+ Kb6 13. Qb4 mate. 7. … Qe7 is probably Black’s least-worst move but it still allows White to win a pawn completely for free after 8. Nd6+ Kd8 9. Qxe7+. Finally, there is the move that Black actually played, 7. … Be6. Mike followed up with 8. Bg5 and Black played the natural-looking (but horribly flawed) 8. … Qd5. White to play and win (Paul Morphy-style!). The answer is not too hard to figure out. In fact, if your rook on a1 has not already started moving to the right by psychokinesis, you’re doing something wrong. Maybe he thought he was escaping with just a pawn down, but it’s worse than that. Threatening to win the knight on b8, which can’t move. Either the king goes to e7 and blocks the Bishop’s diagonal, or it goes to g6 and allows 14. Nxe6 (which also, conveniently, defends the rook on d8). After the game, Mike’s opponent said, “You must have spent a lot of time preparing that variation.” To which Mike responded, truthfully, that he made it all up at the board! Just to be clear, the above comment must have been a joke by somebody. Dana was not my opponent and I did not tell him the name of my opponent. It was also not James Bond. Just being facetious. Thanks for withholding my name, but it only makes me feel I’ve broken the law. Oh, wait! 8….Qd5? IS a crime! I confess…I’m Joji Escoto. I’ve always wondered how Agatha Christie got her criminals to confess so easily. Now I know! Its all in the psychological pressure. Joji, I owe you one. Someday, when you play a pretty combination to win a game, send it to me and I’ll do a blog post about it. 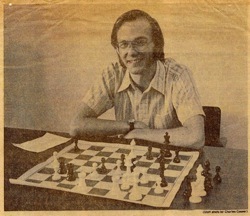 Oh yes, one other interesting thing… I showed this game to the kids in the Aptos Public Library chess club yesterday. I got to the third diagram and asked the kids if they could find a checkmate in two moves. At first there was no response. Then I said okay, I’ll give you a hint and tell you the piece to move, and I pointed to the queen rook. A couple seconds later, one of the kids hollered out, “I SEE IT!! !” and he said the moves, Rd1, Qxe5, and Rd8 checkmate. I was so thrilled because it was absolutely clear that he had seen the two-move combination in his head, and this is a kid who I don’t think has ever done that before.